When studying a color we notice that its hue will vary depending on its illumination and its surroundings. Illumination changes the hue due to the fact that color is in the light. Color is the product of wavelengths that are either absorbed or reflected by the surface of an object. The hue appears to alter according to a colors surroundings as our retina is affected by these wavelengths and how the stimuli are communicated to the cortex, that part of the brain that enables us to distinguish one shade from another. Man has always been aware of the blue of the sky, the green of the grass, and the red of flowers or blood, but the cause of the color phenomenon was not known until the 19th century. In classical times, Greek scholars such as Plato, Aristotle and Pythagoras discoursed on the nature of color. According to Aristotle, the simple colors were those of the elements: earth, sky, fire and water. They were created by blends of light and darkness. He also wrote that black mixed with sunlight and firelight will turn crimson. Leonardo da Vinci, like Aristotle, believed that color was the property of the object. In his Treatise of Painting he wrote: "The first of all simple colors is white, though philosophers will not accept either white nor black as colors because white is the cause or receiver of all colors, and black is totally deprived of them. But as painters cannot do without either, we shall place them among the others." He then organized them in the following order: white as first, then yellow, green, blue and red with black as his sixth color. He continued, "We shall set down white for the representative of light without which no color can be seen, yellow for the earth, green for water, blue for the air, red for fire, and black for darkness." He observed that green resulted from yellow and blue, but did not make any attempt at scientifically organizing colors. Newton proved his theory by setting up a glass prism in a darkened room. Sunlight was directed into the room through a hole in a shutter. When this beam of sunlight passed through the glass prism the color spectrum was produced. He proved that light is the source of all color. By redirecting this color spectrum back through a second glass prism Newton produced white light. His discoveries proved that white light is a compound of all colors and that all colors in the spectrum are present in white light. With further experimenting, Newton discovered that the color of an object is determined by selective reflection of light rays. When light strikes an object some light rays are absorbed and lost. Some light rays are reflected to produce the observed object color. In furniture finishing we add to the wood color; dyes, and or stains, and sometimes colored pore filler and / or glaze. Also there are, various coats of sealers, build coats, and top coats in varying sheens and degrees of clarity from a classic amber clear to a non yellowing water white clear. When we look into this finish of "additive" color, the tones and colors of all layers are combined and reflected to our eyes as the finish color. With a translucent or mostly transparent wood finish the tone of the wood itself becomes an important part of the final color result. with all finish coats including topcoats in place. For some contract finishes color matches are evaluated under specific color-temperature bulbs as specified. The choice of timber or wood specie used can play an important part in obtaining a successful color tone. Very light finishes or finishes with a light background are more difficult to achieve on darker woods. A whitewashed effect finish on cherry or on some mahoganies would be subject to the natural tendency of the woods to darken with time. A Red Mahogany stain or dye applied to freshly milled Mahogany will appear as a more intense red. The red in the wood and in the stain combine and strengthen the red. To darken or deepen a red based stain without making a muddy result, add a bit of green or blue to the red. or eliminate an apparent grain or color mismatch. What is important about Newton's work is that he was the first one to organize colors into a circle. His circle had seven principal colors that he related to the seven planets and the seven musical notes of the diatonic scale: red (C), orange (D), yellow (E), green (F), blue (G), indigo (A) and violet (B). The theory of the three primary colors-red, yellow and blue originated about a century later when a Frenchman, Jean C. Le Bon, published a treatise on pigment mixing. The theory has since become the basis for any work involving colored pigment. Without light there is no color. Total darkness is void of all color. We see the colors produced by an object only when it is bathed in natural light. Everything in nature is composed of various chemical elements. These elements and combinations have varying degrees of light ray absorption. Depending on the elements contained, each object has its own distinctive color. When we look upon a given color of raw pigment we are looking upon a chemical element that is reflecting certain light rays. All the wave lengths of color are present in natural white light, but not all of them are present in artificial light. For this reason a given object will appear to be a different color when moved from natural to artificial light. We have all noticed that some automobile colors appear different at night under certain artificial lighting conditions. With some paint colors this change is very dramatic. In the early l8OO's Sir Thomas Young discovered that each color of the spectrum has a different wave length. He proved for instance that the wave length of red was longer than the wave length of violet. Young's findings led to the eventual discoveries of the invisible rays of ultraviolet, infrared and x-rays by other scientists. Because photography is based on a process involving light instead of pigments, the primaries used in color photography are yellow, magenta and cyan. Hue is the first dimension of color. It is the quality by which we can distinguish one color from another. Hue is synonymous with color. The three primary colors of red, yellow and blue are hues. Black and white are not hues. White and black are the highest and lowest light values respectively. White has the highest degree of light reflectance. Black, on the other hand, has the lowest degree of light reflectance. In the color spectrum all of the lighter colors have a higher degree of light reflectance than the darker colors. White is a tint and black is a shade. The color's value is its position in reference to a white-to-black ladder. When a color is lightened by being extended toward white, the new color is called a tint. When a color is darkened by being extended toward black, it becomes a shade. When it is extended toward gray (an equal amount of white and black), the color becomes a tone. Value is the second dimension of color. Value distinguishes a light color from a dark one. By adding white to any color or mixing a primary of lighter color with it we create a color of higher value. Orange is actually a value of red because of the addition of yellow, a lighter color. Various tints of pink are values of red. Chroma is the third dimension of color. Chroma is the quality that distinguishes a strong, dark color from a weak one. Each of the three primary colors or hues are at their greatest chroma before the addition of tints of intermixing with other colors. They have not been weakened by the addition of white or black. Chroma is the intensity of a color. Thus a color in its greatest intensity is at its greatest chroma. We can see that chroma is very closely related to value in color. Red, Yellow and Blue are called primary colors. They cannot be obtained by mixing together other colors. Orange, green and violet are called secondary colors. They are obtained by mixing in equal amounts two adjoining primaries. Orange results from the mixing of red with yellow. Green results from the mixing of yellow with blue. Violet results from the mixing of blue with red. such as yellow-green (chartreuse), green-yellow (apple green), etc. Tertiary colors are obtained by mixing together two secondary colors, such as orange with green (olive), green with violet (slate) or violet with orange (russet). Colors that appear opposite from each other on the color circle are called complementary colors. Complementary colors include: red and green, yellow and violet, blue and orange, etc. A complementary color is often used to reduce the chroma (brightness or intensity) of its opposite. When two complementary colors are mixed in equal parts, although theoretically they should produce black, they produce (neutral) a grayish dark brown. Warm colors are those of the fire and sun, reds, yellows, oranges and red violets. Cool colors are those of ice and the oceans, Blues, blue-greens, & blue-violets. Several color systems or theories have been developed over the years. The most widely accepted is the Prang system named for Lewis Prang, its inventor, because it lends itself to wood tones & color mixing for furniture finishing. 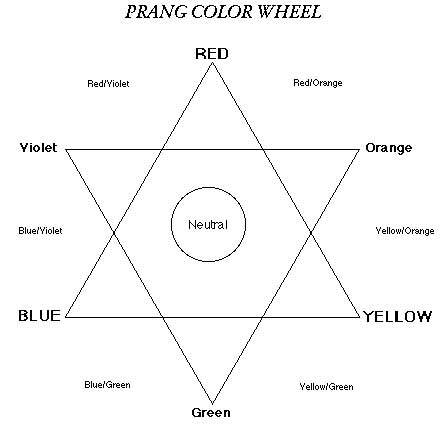 The Prang system uses twelve colors to complete the spectrum circle. There are six base colors plus six intermediates. An intermediate is a 50/50 mix of two adjacent base colors. Color theory and diagrammatic representation assumes pigments to be equal in chroma strength. In the real world pigments & dye colors vary in chroma intensity. You might use unequal measures of 2 pigments to reach a true 50-50 mix of color. The Prang System is composed of the three Primary colors; Red, Yellow and blue, and three Secondary colors; orange, green and violet. Orange, green and violet are themselves actually intermediates. Orange is a mix of red and yellow, Green is a mix of yellow and blue, and Violet is a mix of red and blue. Note: white and black are not included in the Prang color spectrum. White and black are not regarded as colors. It is very important that the furniture finisher have a good working knowledge of color. It is quite simple to tint or shade a batch of stain to match a given standard if one understands color theory. While nearly all of the dyes and pigments used by the finishing industry are blends of primary and intermediate colors, the theory is still practical. Several color mixing charts have been devised over the years. One of the very best for the furniture finisher is the Prang Color Computer. It is a very simple, easy to understand, revolving disc with windows showing resultant color mixes, and is highly recommended to every finisher. By turning the revolving discs we can easily see exactly what 50/50 mixes of all the primary colors, secondary primaries and their intermediates are. Also shown are the resultant tints and shades by adding white and black. The Color Computer is based on the prang color system and should be in every furniture or cabinet finishing shop. Every finisher should understand color theory, study the prang color wheel, and memorize each color and its relation to other colors. When we add white to any color or mixture of colors we create a tint. This is generally spoken of as "tinting up", as we are raising the degree of reflectance. We raise the value by adding white to any color. A tint is a lighter value of chroma. When we add black to a color we create a shade. By "shading down" we are lowering the reflectance. We lower the value by adding black to any color. A shade is a darker value of chroma. When working with colors we are often times actually tinting a shade. Brown is a shade of orange. Orange was intermixed with black to create brown. By adding white to brown we create tan. We have created a tint from a shade. As we add one color to another each step is a tone. Tone is any step as the color passes from a light to dark shade or vice-versa. For instance, as we add yellow to red we create orange. Orange is actually a tone of red. As we increase or decrease the addition of yellow to red, each step is a tone. Raw Sienna, Chrome Yellow, etc. are not pure colors. If pure primary colors were available in dyes or pigments the color formulator's job would be quite simple, but they are not, so the blending of stains and paints is quite complex. The palette: is a selection of colors chosen by he finisher to be used on a project or all finish work. One does not need all of the available dye and pigment colors to do a good job of color matching, but it is essential to have at least one each of red, orange, yellow, green, blue, plus black and white to do an effective job. Pigments should be as near to pure colors as possible. You will need a palette of colors in a variety of media. These include Match-o-Blend powdered pigment (MOB's) to be used in touch-up media for finish repair, O-J (oil-japan) colors for color mixing and/or adjusting of oil based finishes, and Concentrated Lacquer Tinting Colors for tinting and mixing lacquer based materials. NGR stains will be color adjusted using the NGR concentrates. The pigments most used to shade, tint, or adjust the color of premixed finishes include the three primaries: Red, Yellow and Blue; the secondaries: Orange, & Green. Important also are the earth colors: Yellow Ochre Raw Umber, Burnt Umber, Raw Sienna, Burnt sienna, Vandyke Brown and of course, White and Black. Raw Umber is a cool brown made of blue-green and red. When mixed with white, raw umber produces a cool neutral gray. Burnt Umber is a warm brown composed of red, red-orange and green. Mixed with white burnt umber produces a warm beige. Raw Sienna is composed of yellow, red and blue-green. Extended with white, Raw Sienna yields a warm cream color. Burnt Sienna is composed of red, red-orange and blue. &, with more white, a reddish pink. Extended with white, Burnt Sienna will find its use as a base under gold leaf. Extended with white, Vandyke Brown will produce a purplish beige. Orange is made by mixing Yellow with Red. Green is made by mixing Yellow with Blue. Purple or Violet is made by mixing Blue with Red. Red and Black With a little Yellow make Brown. Red and Green will make Brown. White added to Black will make Grey. Grey added to Yellow will make Citron. Grey added to Red will make Russet. Grey added to Blue will make Olive. Orchid is an addition of White to Violet. Pink or Flesh is the weakening of Red with White. Light TINTS of all colors can be had by adding White. Dark SHADES of all colors are made by adding Brown or Black. The same color principals apply here. The silvers and pewters are used to lighten and make the gilt tones colder. The copper colors are used to warm the brassy golds. Traditionally gold was applied over a red or yellow base of bole and silver toned gilding was often applied over a black or a grayed base. These bole colors may not be noticeable in the finished piece, however even with the apparent opaque nature of the gilt, the base color does effect the finished tone. In repair or replication work this colored base must be applied to match the original. This step is imperative with certain effects where the base color shows through the gilt or bronze color. The painters job is straight forward. Mix a paint color to match, apply a primer, and a coat or two of paint and the surface becomes the paint color. With an opaque paint, the object color is covered or "subtracted" leaving only the paint color. Think of this as "subtractive" coloring or finishing (the paint obscures all of the substrate color). The best time to start finishing is at the lumber rack. Think about the desired final finish result when the selection of wood tone, grain, and figure is made. This page & all contents Copyright © 1995-2016, Ron Ashby & Shellac.net Wood Finish Supply.